Hello all! 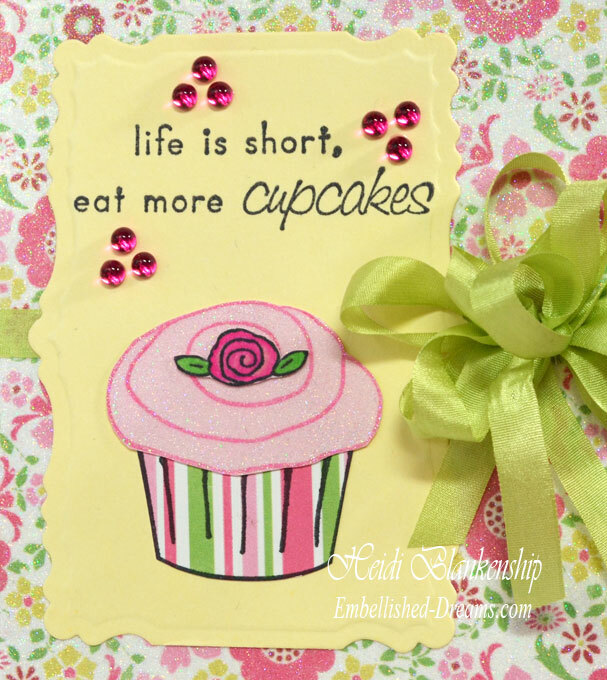 Tesa here to share a card. 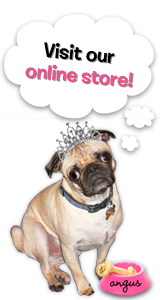 I adore the mini sets from The Rubber Cafe' – always cute and fun with great sentiments! For today’s card I’ve used Biggest Fan. The sentiment is a great one and I’ve used the lovely fan image for a subtle background pattern for my Luggage Tags. 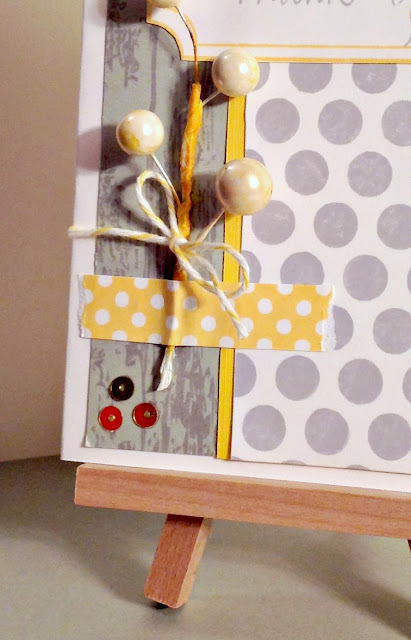 I cut out the center of the tags and added the stamped background paper behind it. Stamps: The Rubber Cafe' – Biggest Fan, Luggage Tags. 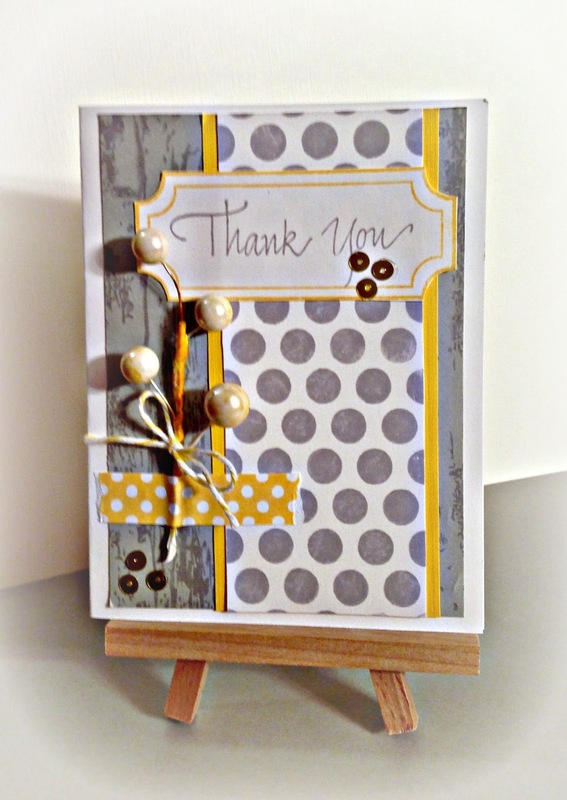 Fun with a Triple Layer Card! Hi There! Kendra here today with a tutorial on how to make a Triple Layer Card. I've seen a few of these on Pinterest and thought it would be fun to make one with one of my favorite images from The Rubber Cafe', the Extra Large Daisy. So this is how you make the card. First cut 3 pieces of light cardstock ~ 2" x 3 1/4"; 3" x 4 1/4"; and 4" x 5 1/4". Then gather your image(s) and coordinating inks. Next, using a removable adhesive, attach your layers from largest to smallest. You want to use a small amount of adhesive to attach them so they don't move while you are stamping. Next, ink your stamp. I used 3 orange & gold shades of Memento Dew Drops. I used Potter's Clay in the center of the Extra Large Daisy image, then Tangelo for the flower and Morroco for the edges of the flower petals. 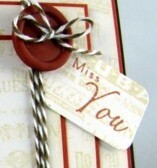 Stamp the image on the stacked cardstock. 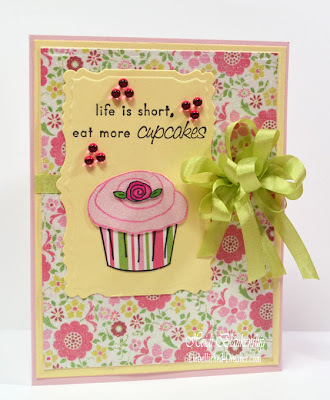 Next I used the background image from the Vintage Treasures stamp set randomly stamping to fill in all the white space around my daisy as background fill for the card. 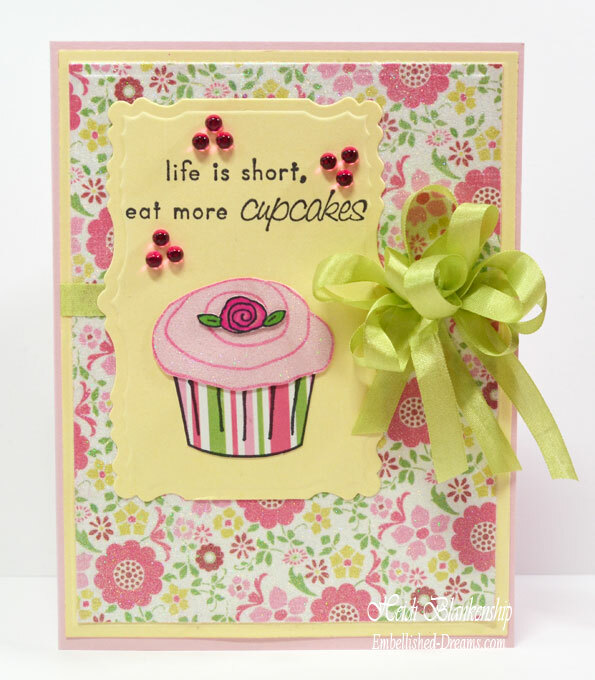 When you stamp several layers of cardstock at the same time, there will be a gap in the stamped image. So you add a coordinating mat under each stamped layer. 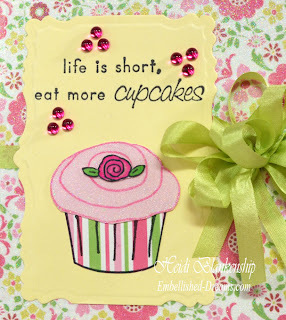 I added a tag using the Fabulous Phrases stamp set and tucked it with a matching button tied with bakers twine. Hello everyone!! Today, I have a sparkling card and a tutorial to share with you using Scrap Happy Sheer Glue and You're So Fine Glitter Diamond Clear Cool Highlights. 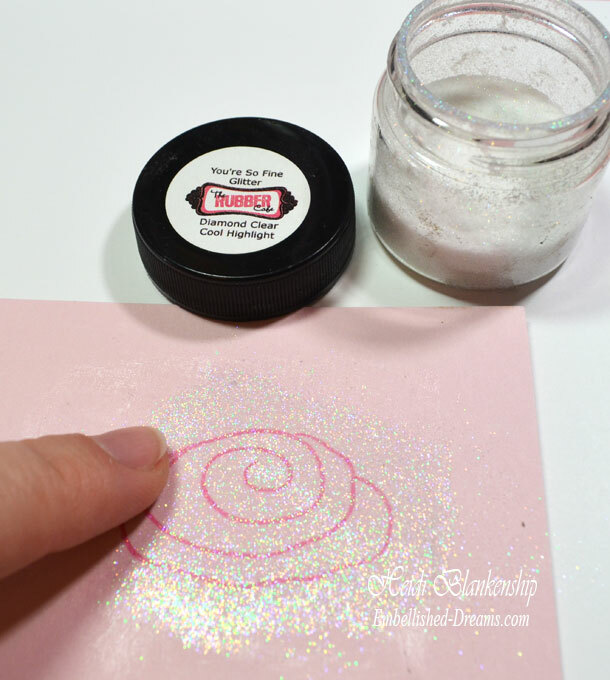 Making your own glitter paper is so easy--you will love it! 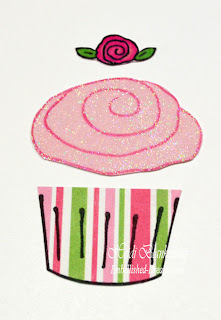 I stamped the frosting image from the Hey Cupcake! stamp set from The Rubber Cafe`. Then I used a makeup sponge to apply Scrap Happy Sheer Glue over the entire image. 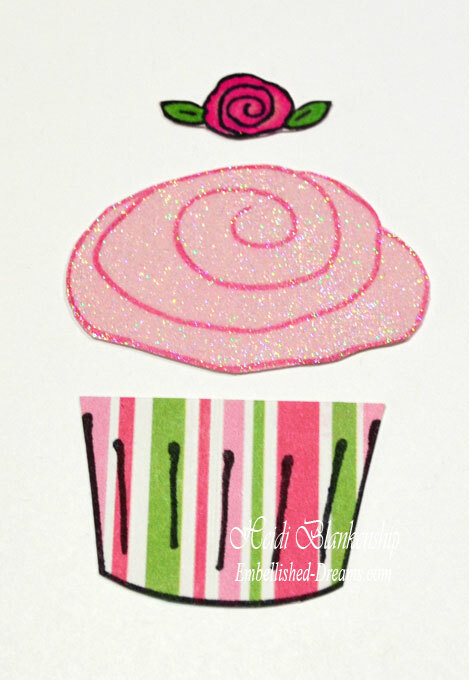 For the bottom half of my cupcake I stamped it a striped patterned paper fromCarta Bella's True Friends 6 x 6 paper pad. Next I stamped the flower, colored it with Copic markers and fussy cut all of the pieces. 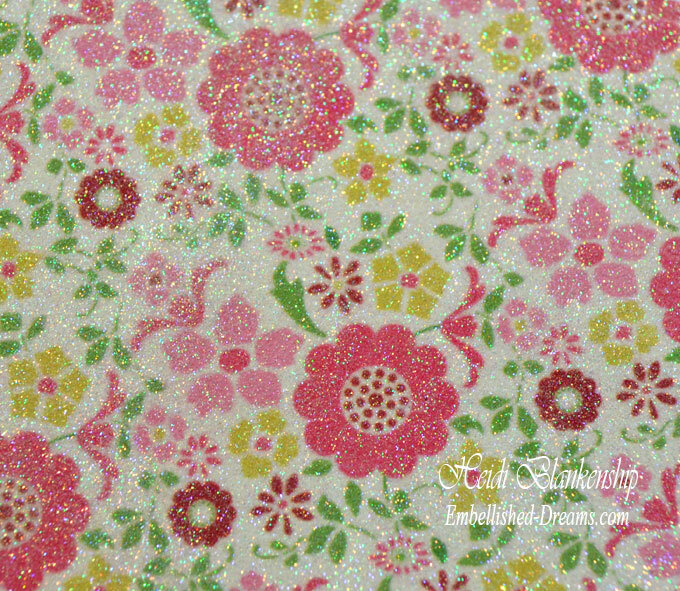 For my background I selected a floral pattern paper, and turned it into glittery patterned paper. 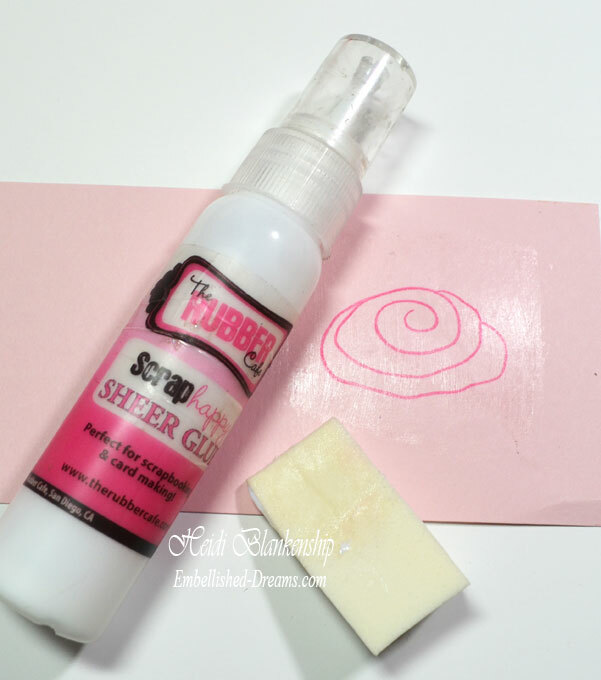 Follow the same instructions as mentioned above using a makeup sponge to apply the Scrap Happy Sheer Glue over your entire paper, burnishing again with the You're So Fine Glitter Diamond Clear Cool Highlights . Here is a close up of the paper--check out all of the sparkle! Just gorgious! And my finished card... I used A2 Matting Basics A, A2 Matting Basics B and Labels Twenty-Nine die templates to create all of the die cuts. I added some pretty Celery Green Silk Ribbon and Diva Pink Jellie Dots from The Rubber Cafe` to embellish the card. 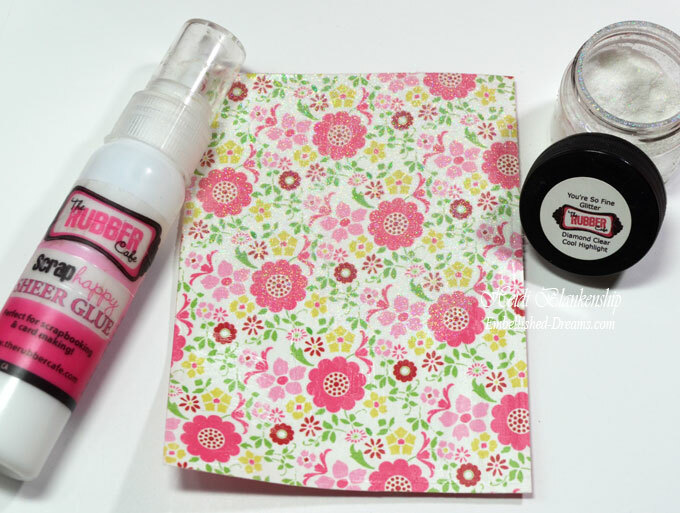 I hope you enjoyed the tutorial for making your own glitter paper! If you give the glitter paper a try post a comment with a link-- we would love to see it! 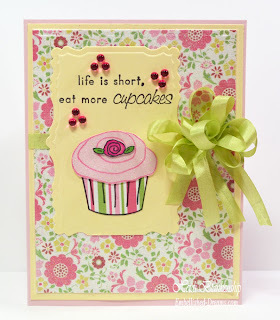 Stamps: The Rubber Cafe`- Hey Cupcake!